Sixty authors, boodles of books, guest speakers at the Bijou Theater. Come to the Northwest Authors Fair in Lincoln City. Well, I had to go to that. Yes, I remembered that I sold only one book when I attended that same event two years ago. The year before that, I did slightly better and I got great information for a column, but I fried in the sun. This time I had a new book, Shoes Full of Sand. Folks would see that it’s local and lovely and buy it for their beach bags. After all, the fair is sponsored by Bob’s Beach Books, which sells “beach reads.” Shoes Full of Sand, perfect. Lincoln City on a summer Saturday is one big traffic jam. Highway 101 is the city’s two-lane main street with no left-turn lanes or lights and limited parking. It took me an hour, and I was on time, but it was only by the grace of God that I entered the parking lot behind the store just as a family vacated a spot. Mine! Dragging my wheeled cart of books to the plaza next to the store, I walked right into a snarl of confused writers, tables so close you couldn’t walk between them, and wind so heavy people screamed every time the canopies rocked. Most of the tables were already full. I found a space on the end between the canopies so I could get sunburned and windblown at the same time. Put anything on the table and it blew off. My books were just heavy enough, but the gales threatened to tear off the covers. Despite the blue sky, it was freezing in the wind-tunnel where I sat between two fantasy writers with my utterly factual Stories Grandma Never Told, Shoes Full of Sand, and Freelancing for Newspapers. Apparently it was warm everywhere else. We zipped up our jackets and hunkered down, waiting for crowds that never really arrived. The city was full of people, but most didn’t get out of their cars. Some authors didn’t sell anything. 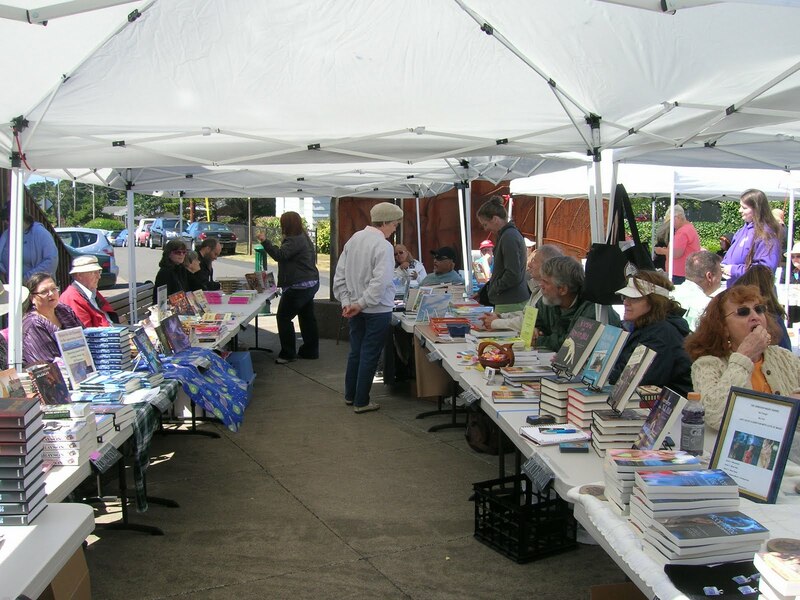 Most of us sold a few books to other authors and to the bookstore. Occasionally we stumbled up the back stairs of the bookstore for trips to the bathroom–unisex, full of new books waiting to go on the shelves–and the kitchen, where one could get coffee and cut-up vegetables. We looked at our watches a lot. Occasionally someone would come, pick up a book, read the back cover, admire the front cover, ask if we were the author. We held our breaths, thinking “come on, buy it,” trying to be as cheerful and encouraging as possible without being pushy. Usually they walked away. But sometimes . . . it’s called partial reinforcement; it’s why people gamble, and why we show up at book fairs. One new twist this year was a reception at a gorgeous house in a gated community in the waterfront community called Roads End. We enjoyed stuffed mushrooms, mini-quiches, giant shrimp, and Willamette Valley wines. After our afternoon in the wind, most of us authors felt like poor relations, but it was nice. If nothing else, it got us authors together. Thanks to Bob and his crew for all their hard work. Go buy a book at Bob’s, 17th and 101, Lincoln City, Oregon. On my restroom trips, I could barely resist buying everything I saw on the shelves while waiting in line. So many authors, so many good books!